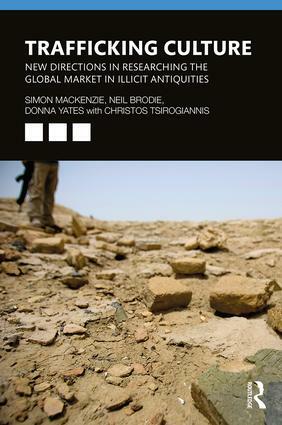 Trafficking Culture outlines current research and thinking on the illicit market in antiquities. It moves along the global trafficking chain from ‘source’ to ‘market’, identifying the main roles and routines involved. Using original research, the authors explore the dynamics of this ‘grey’ market, where legal and illegal goods are mixed and conflated. It compares and contrasts this illicit trade with other ‘transnational criminal markets’, such as the illegal trades in drugs, wildlife, conflict diamonds, timber, human trafficking, and counterfeits. The analytical frames of organized crime and white-collar crime, drawn from criminology, provide a fresh perspective on a problem that has tended to be seen as archaeological, rather than criminological. Bringing insights from both disciplines together, this book represents a productive discourse between experts in these two fields, working together for several years to produce the evidence base that is reported here. Innovative forms of regulation are the most productive way to explore crime control in this field, and this book provides a series of propositions about practical crime reduction measures for the future. It will be invaluable to academics working in the fields of archaeology, criminology, art history, museum studies and heritage. The book will also be a vital resource for professionals in the field of cultural property protection and preservation. Chapter 2: Interfaces and antiquities smuggling chains: blurring on the margins of "Source", "Transit", "Destination Market"
Chapter 6: Autoregulation of the destination market? Simon Mackenzie is Professor of Criminology at the University of Wellington and Professor of Criminology, Law and Society in the Scottish Centre for Crime and Justice Research at the University of Glasgow, in the College of Social Sciences. He is author of Going, Going, Gone: Regulating the Market in Illicit Antiquities (2005) and co-editor of Criminology and Archaeology: Studies in Looted Antiquities (2009). Neil Brodie is a Senior Research Fellow on the Endangered Archaeology of the Middle East and North Africa (EAMENA) project at the University of Oxford. He co-edited Archaeology, Cultural Heritage, and the Antiquities Trade (2006), Illicit Antiquities: The Theft of Culture and the Extinction of Archaeology (2002), and Trade in Illicit Antiquities: The Destruction of the World’s Archaeological Heritage (2001). Donna Yates is a Lecturer in Antiquities Trafficking and Art Crime at the Scottish Centre for Crime and Justice Research at the University of Glasgow. She completed her PhD in Archaeology at the University of Cambridge, and is the lead educator for the University of Glasgow’s Postgraduate Certification in Antiquities Trafficking and Art Crime. Christos Tsirogiannis is Associate Professor, Faculty of Arts, Museum of Ancient Art, University of Aarhus. He conducts multi-disciplinary research on international networks trafficking in illicit antiquities. Recent article topics have included museum ethics, market 'due diligence' and the evidential basis for repatriations, to which his identifications of illicit objects frequently lead.